NIST engineer Jodie Pope shows scale of the newly arrived Big Blue Ball. Last year, upwards of 25 trillion cubic feet of natural gas were delivered to customers in the United States, and when it changed hands, nearly every cubic foot was measured using gas flowmeters. The accuracy of those meters has enormous commercial importance, and NIST has a long-standing research program to improve flowmeter calibration. The scope of that program has now literally expanded in the form of a newly arrived test bed known informally as the Big Blue Ball. Typically, calibrating flowmeters entails flowing a gas stream through the meter under test and then into a collection tank during a measured time interval. The accuracy of the flowmeter calibration factor depends on a low uncertainty measurement of the mass collected in the tank. The quantity of collected gas is commonly determined using: (1) the tank’s precisely known volume multiplied by (2) the change in density of the gas in the collection tank before and after the filling process. The density determination requires measuring the pressure and the average temperature of the collected gas. Unfortunately, the average temperature of the collected gas is tough to pin down. When pressurized gas flows into a large tank, the flow generates a non-uniform temperature distribution throughout the collection tank. Soon after the flow stops, the warmest gas ends up near the top of the tank and the coolest gas ends up near the bottom. This situation makes it difficult to measure the average temperature by conventional means. A prompt reading of a few thermometers is inherently inaccurate, and the temperature gradients in big tanks persist for hours or days. To circumvent the temperature-gradient problem, NIST calibrates many small flow meters, one at a time, and then uses them in parallel to calibrate larger meters. The small meters are calibrated using a small collection tank that is thermostatted to quickly eliminate temperature gradients. However, the multiple calibrations are time-consuming and labor-intensive, and therefore expensive. Two years ago, scientists at NIST’s Physical Measurement Laboratory attacked this problem successfully by devising and demonstrating the use of “acoustic thermometry” to accurately and rapidly measure the average temperature. They proved the principles using pure argon gas in a small tank. Now, they are scaling up acoustic thermometry using a large high-pressure spherical vessel as the collection volume. Since the term “large high-pressure spherical vessel” is a mouthful, it was affectionately renamed the Big Blue Ball. The blue ball is on loan to NIST’s Gaithersburg, Md., campus, thanks to a Cooperative Research and Development Agreement (CRADA) with Colorado Engineering Experiment Station, Inc. (CEESI). CEESI is an independent laboratory that calibrates flow meters, including those used in natural gas pipelines. Ultimately, Moldover’s group expects, CEESI and other calibration laboratories will use their technique on their sites for much larger tanks and meters. The NIST method is based on a fundamental physical principle: When a sound wave travels through a gas with regions at different temperatures, the sound wave's average speed is determined by the average temperature of the gas. Using this scheme, the very difficult task of measuring temperature is replaced by the much simpler one of measuring the speed of sound waves as they move from transmitter to receiver. Because the physics in the Big Blue Ball is identical with that used for proof-of-principle tests, scale-up should be straightforward. However, Moldover’s group is moving carefully to identify potential measurement problems at increased volume and pressure. So far, the researchers have brought the pressure in the Big Blue Ball up to 2 MPa (20 atm) on the way to 7 MPa (70 atm). They anticipate obstacles. 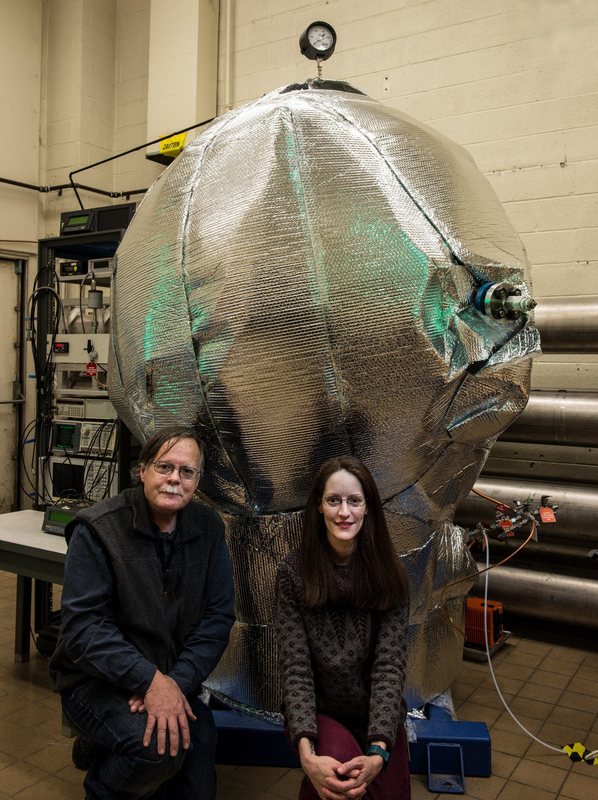 Keith Gillis (left) and Jodie Pope with the Big Blue Ball covered in thermal insulation for experiments. NIST does not have the infrastructure required to test really large flowmeters of the sort used in interstate pipelines, where flow rates reach 5 m3/s at pipeline pressures up to 7 MPa. However, NIST’s CRADA partner, CEESI, has a calibration facility located next to a pipeline and they have collection vessels with volumes of 20 cubic meters. Thus, the lessons learned from the big blue ball will reach industry. *The actual number of molecules (i.e., the mass, which determines energy content) in a cubic foot of gas can vary significantly depending on changes in pressure, temperature, and other variables. If all of those except temperature are known, then the average temperature in the gas can be used as a sensitive measure of the mass. In the NIST system, volume is measured to high accuracy -- about 1 part in 10,000 -- by bouncing microwaves between one wall and another and observing which wavelengths resonate in that path. Microwave measurements are also made for thermal and pressure expansion. NOTE: Any mention or depiction of commercial products within NIST web pages is for information only; it does not imply recommendation or endorsement by NIST.